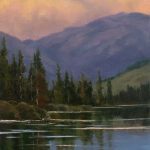 Sierra Lake at Sunset, oil painting from the Western Sierras. Beautiful sunset with magnificent cloud formations, reflections, and ripples on the lake. 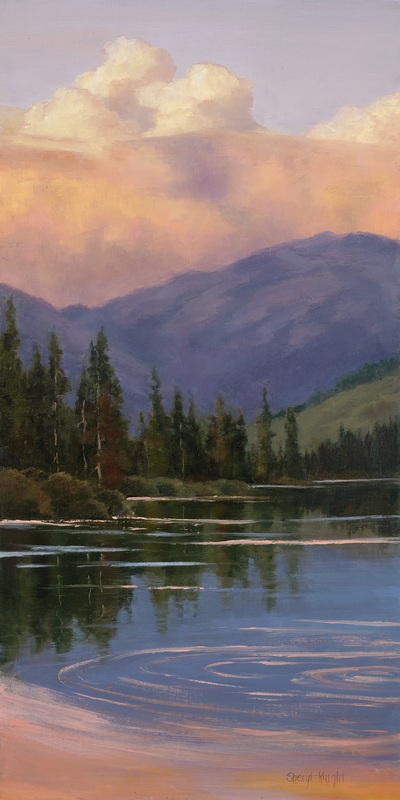 The scene was from late summer evening at Hume Lake when the water was very still so the reflections were clear. A passing duck caused the top of the water to ripple, reflecting the clouds above in the ripples. It was actually a much wider scene but I thought it would be interesting just to crop a long vertical piece from the middle. If it shows top on the website as a square be sure and tap on the picture to have it show the whole painting. The beauty is in the clouds at the top. It is an awesome portrayal of a minute and specific moment in time, reflecting the majesty of God’s creation. Love it! Thank you Jeanne for your comment on my painting of Hume and the clouds. They were a challenge to paint. How does God continually give us such beauty to enjoy when we don’t deserve it. It must be because He is so beautiful and it is just His nature to bless us. It was fun to see a comment on my website as I only receive about one a year!! Thanks! Love you.